My alarm went off at 5am and I jumped out of bed. I always get nervous before a flight and that includes other people's flights when I am responsible for getting them there on time. I got ready and checked to see if my nephew had finished packing. His suit was still hanging in the closet but his suitcase was full. I opened it and found his dress shoes (at least he remembered those) and 5 pairs of cargo shorts (3 were camouflage pattern) as well as t-shirts. I don't think he was thinking about the temperature in Minnesota. The high is around 25 degrees. Some of the shorts came out to make room for the suit and we left for the airport on time, I thought. The line to check in was all the way to the door and then the line for security wrapped around the ticketing area. He made it but, wow, I've never seen our airport so crowded. I got to work early and drank a Coke to wake up. I'm not a coffee person. Usually I drink tea but occasionally I need something stronger. We had our office audit so I was nervous until it was over at noon. After that, my brain slowly tried to relax and prioritize my gift list which needs to get done in the next few days. I tried to leave work early but ended up chatting with a coworker and then there was a huge traffic jam because an accident closed down the I-10 freeway and it was re-routed on to my usual way home. I had to take another route which took twice as long. Anyway, came home to just the dogs and didn't have to make dinner for anyone, well, except for the dogs. I made pan fried asparagus in olive oil with JoJo potato seasoning for myself. It was good. Here is a picture of the tree that my nephew and I decorated last weekend. He wanted to know why I was bothering to put it up since he was going to Minnesota. I said there wasn't a minimum occupancy requirement to have a Christmas tree. He then commented that the trees of his childhood were much larger. I was thinking, or maybe you were smaller, hmm? I only put lights around the front window with some garland instead of stringing the whole house. I have the window lights on a timer so I don't have to worry about it. My cardboard "gift" boxes wrapped in paper are in the front yard. They got rained on last weekend so I should recycle them and make new ones for next year. They are easy to make. Large cardboard boxes, a rock or two inside, wrap them and add ribbon and a bow. A very inexpensive decoration if they can be protected from the rain/snow. We have had freezing temperatures at night this week so my tomato plants have mostly died. I pulled off all the green ones and they will ripen slowly. I need more recipes for tomatoes. Maybe I'll make and freeze tomato sauce. One of these years I am going to start a tomato plant inside so that I have tomatoes by the time my green tomato stash runs out. That's on my to-do list after I quit my job. 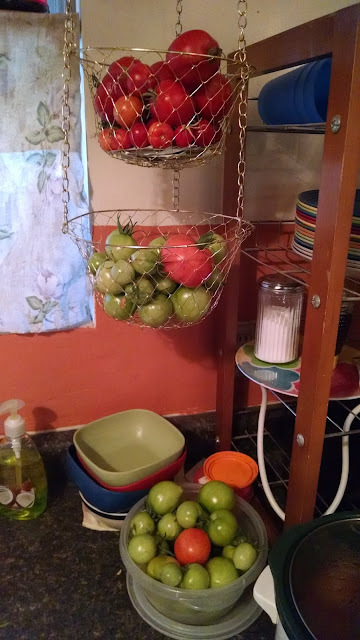 Until then I will just have to appreciate my abundant tomato harvest while it lasts. I feel ya. When Tim goes anywhere, I'm totally freaked out the day before, and I'm stressed out before we leave for/get to the airport. I love that your nephew thought shorts would be a good idea for Minnesota. Or even here at the moment. Poor Tim's knees are so sensitive, he's wearing long johns PLUS his Chewbacca suit to stay warm at the movie theater. LOL on the shorts in Minnesota in December! Your tree looks beautiful. Merry Christmas! Thank, Lizzie. 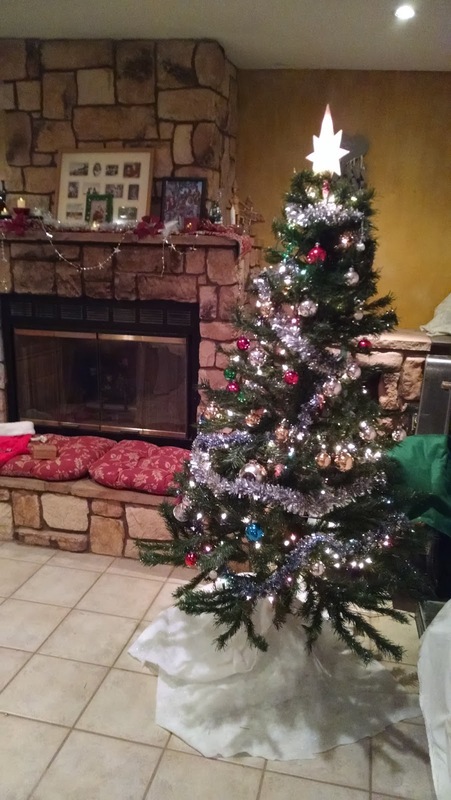 The tree makes it very festive. Anonymous, I did grow all those tomatoes. They grew like weeds this year even though I mostly ignored them. I can't even eat enough tomatoes to keep up. Michelle, and he even lived there last year. Short memory I guess. At least he wore his jeans so he has one pair of pants. Maybe his relatives will take pity on him and buy him another pair of pants while he's there. Merry Christmas to you too, Dave!